Cooking can be one of life's most enjoyable, soul-satisfying activities. It is a way to simultaneously exercise both the creative and nurturing sides of a cook's personality. Cleaning up afterward, of course, is just work. Modern automatic dishwashers have made the job easier, and the battery of modern technology represented by nonstick pans, new cleansers and nylon scrubbing pads are all helpful. 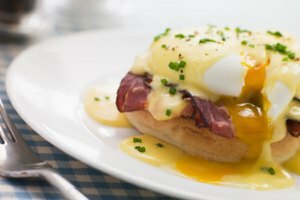 However, eggs and other protein-based foods can stick badly, and will still usually require some effort to remove. Scrape away as much of the excess egg as you can. Use metal utensils on cast iron or stainless steel, but most other surfaces require wood or plastic. Soak the pan in warm, soapy water for at least five minutes or up to 30 minutes for easier scrubbing. This will soften and loosen the cooked-on egg. Scrape out the softened egg as much as possible with a nonmetallic spatula or wooden spoon. Discard the egg. Scrub the remaining egg from the pan using a non-abrasive nylon scrubbing pad or scouring sponge. Rinse well under very hot water, then air-dry. Scrape away as much egg as possible in your cast-iron pan using a spatula or wooden spoon. When the pan has cooled, run a small amount of cold water into the bottom and allow it to rest for five minutes. 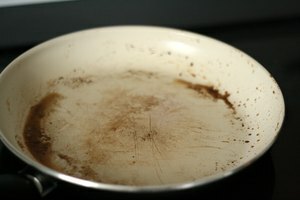 Don't use dish soap as it will damage the pan's seasoning. Repeat the scraping process, removing as much of the soaked egg as possible. Scrub lightly with a non-abrasive scrubbing pad, if necessary. Heat the pan over a medium burner, if a small amount of egg is still stuck. Pour 1 tbsp. of oil into the pan and swirl it to cover the entire surface. Pour 1/2 cup of coarse salt into the cast-iron skillet and use a wadded kitchen towel to scrub vigorously with the salt until all remaining egg residue has been removed. Pour the salt into a heatproof bowl. 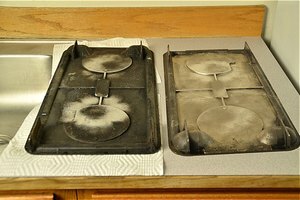 Wipe the hot pan with a clean cloth dipped in vegetable oil to coat the surface and prevent oxidation. 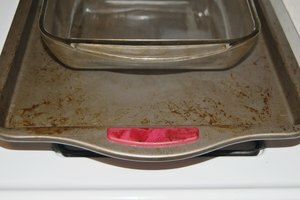 Cool the pan and wipe away any excess oil.